Paying for apps and services directly on your monthly phone bill might be the norm in some countries, but until today you haven’t been able to pay for anything directly from the new Windows 10 store. And even now, you still can’t – unless you’re a Sprint customer living in the US. The launch delivers on a promise Microsoft made in April to begin rolling out carrier billing before the end of the year, and as it’s enabled across all Windows 10 devices, it means you can bill directly to your phone from desktop devices for the first time. If you’re one of Sprint’s 57 million subscribers, you can now use just your phone number to buy movies, music games or apps without a credit card on file. Your Sprint mobile number will need to be registered in your Windows Store account first though. It’s not known – and Boku’s not saying – whether the company is powering Apple’s carrier billing trial in Germany but given the company’s four billion user footprint, it’s a likely contender for the deal. 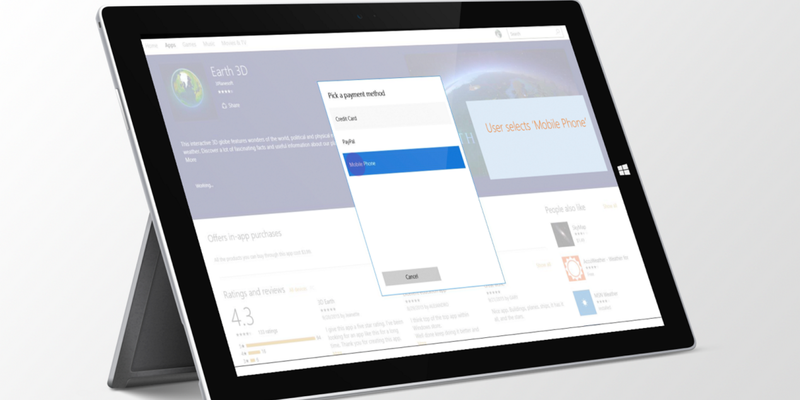 For Microsoft, it’s a win-win, as it allows users to spend more money on apps with even fewer barriers to payment, and therefore more completed purchases. Microsoft says that carrier billing tends to see a three-times increase in sales in developed markets and an eight-times increase in emerging markets. For users, it’s convenience and the reassurance of not needing to worry about your credit card information being transmitted anywhere.